A very happy holidays to all of you! I hope you get wherever you are going safely (even if that is just your own dining room). Travel safe and eat well! If you’re looking for a fast (and even somewhat elegant) appetizer to take to a holiday party over the next week or so, just go ahead and move these Puff Pastry Palmiers to the top of the list. They have three ingredients (okay 8 if you count a few pinches and dashes here and there). But, let’s just agree that it’s three main ingredients. They are excellent warm, but also very delicious at room temperature hours after baking. And, I guess they somewhat resemble palm trees (palmiers) and that is a desired shape for baked appetizers, according to history. They are also sometimes referred to as elephant ears which sound less appetizing in my opinion. 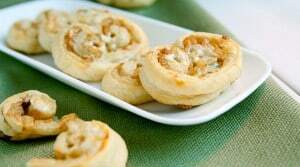 Puff Pastry Palmiers stuffed with caramelized onions and creamy blue cheese. 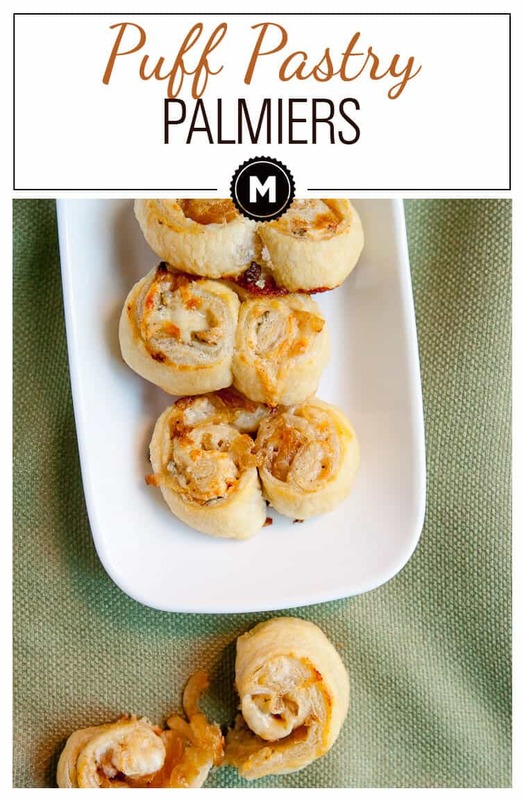 An easy and elegant appetizer that is sure to be a hit at your next party! 1) Thaw puff pastry dough according to instructions and preheat oven to 375 degrees F.
2) Slice onions into thin slices (but don’t chop). Add to a medium pot with butter, brown sugar, vinegar, and a pinch of salt. 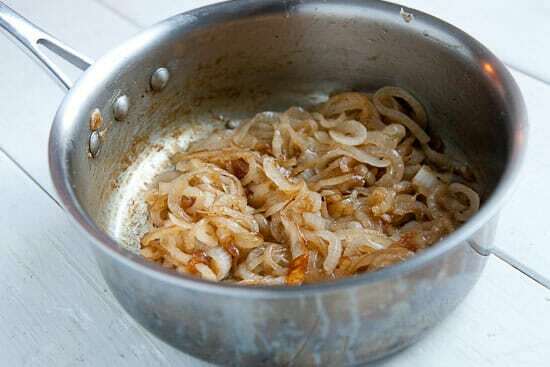 Set over medium heat and cook until onions start to caramelize. Stir regularly to promote even browning. Cook for 20-25 minutes until onions are lightly browned. 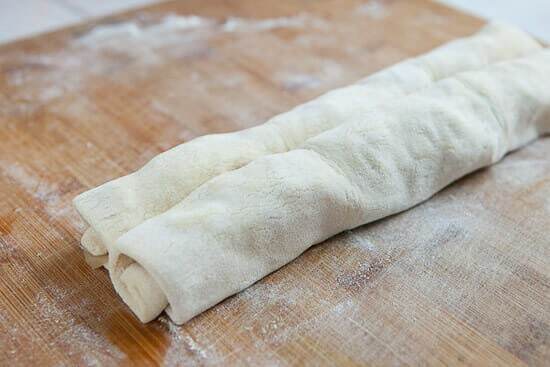 3) When you’re ready to make palmiers, roll out one sheet of puff pastry on a lightly floured surface. 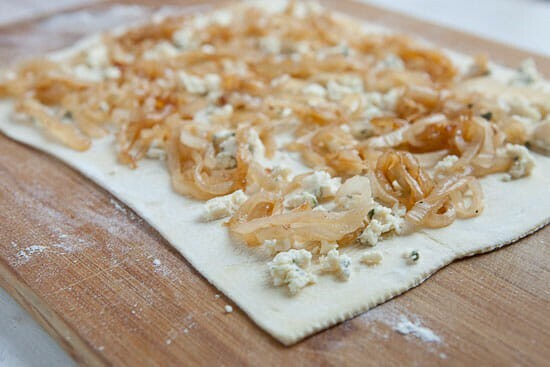 Sprinkle with crumbled blue cheese and spread over half of the caramelized onions. 4) Roll puff pastry edges in where they meet at the center. 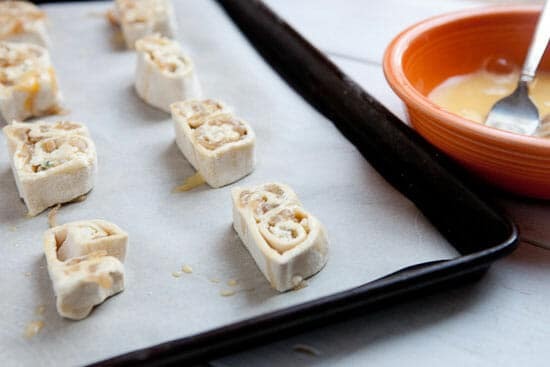 5) Slice puff pastry log into 12 even pieces and transfer each palmier onto a baking sheet lined with parchment paper. Brush them with egg wash.
6) Bake palmiers at 375 degrees F. for 15-16 minutes until they are nicely browned. Let cool briefly before serving. These keep fine at room temperature for a few hours if you need to make them in advance. Store leftovers in an airtight container. The key to good caramelized onions is patience. If you are doing one large onion, it’ll take about 30 minutes for them to cook down correctly. If you cook them too quickly, they will just burn. 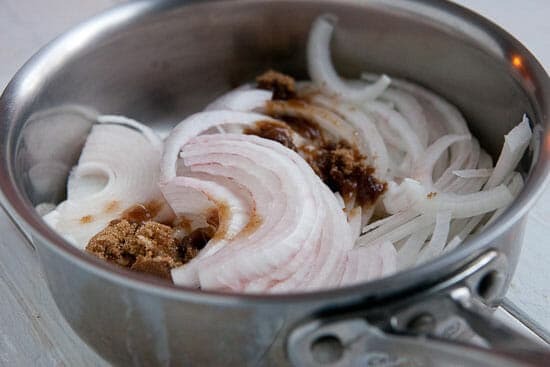 Cut the onion into slices and add them to a pot with butter, brown sugar, vinegar, and a pinch of salt. Get these cooking over medium heat. Stir these regularly as they cook down. They will cook down to about a quarter of their original volume and will smell really good. If at any point you notice the onions getting too dark, reduce the heat and hit the pan with a splash of water to cool it down. After about 25-30 minutes of cooking and stirring (occasionally not constantly), these were my finished onions. Could you make homemade dough for this? Absolutely, but using frozen puff pastry dough is really the way to go in my opinion. It makes them very easy to make almost on a whim rather than a huge cooking project. Just thaw the dough according to the brand you are using and then roll out a sheet on a lightly floured surface. 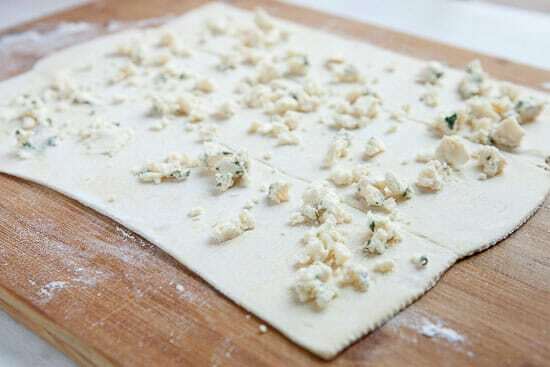 Sprinkle the pastry with some crumbled blue cheese (a little goes a long way here). Then pile on about half of your onions. These are really flavorful so you don’t need to go crazy with them. One onion should be enough to make two sheets of puff pastry palmiers. 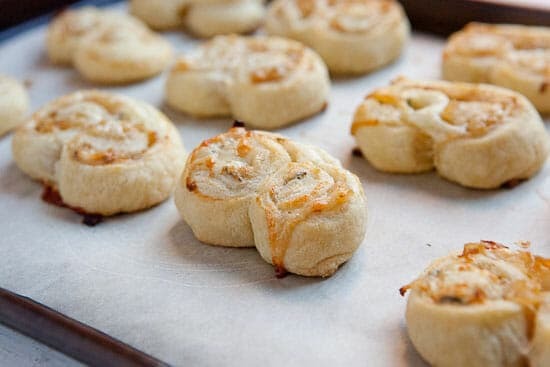 After that just roll up each end of the dough until they meet in the middle! Then you can slice them up and transfer them to a baking sheet. I recommend brushing them with some egg wash to make sure they brown nicely. Sort of an optional step though. Bake the puff pastry palmiers at 375 degrees F. for around 16 minutes until they are lightly browned around the edges. Call them ears, call them trees, or call them palmiers. Just make them though and people will be calling for more! Thanks Nick, Was looking for a quick appi for our Christmas dinner tonight (we have it on the 24, so I get to be with the family and not in the kitchen on the 25). this one looks perfect. Awesome Susan. Glad you can put them to use. Happy holidays! have you frozen them after cooking? need make ahead treats. Hey Sandra, in my experience puff pastry doesn’t freeze that well, but you could roll them up and freeze them BEFORE baking them. Then just slice them up and bake them before you are ready to roll. They are fine at room temp for a few hours also. Good luck! Is there a worthy substitute for the bleu cheese? Definitely Heather. I think Swiss and/or Gruyere would be my next choice. Good luck! Yum, these look delicious! Wish I had frozen pastry on hand. Will have to try these next week instead… Happy holidays! Made these for a NYE party, they were a big hit even though mine were not quite as pretty as your final product =) I love the blue cheese caramelized onion combo!